With football season, wrestling practice, homework, and Church activities during the week, some nights it’s really hard to find the time for dinners that require a lot of prep. My kids keep me on the go, and there’s never a dull moment. However, with so many activities crammed into just a few short hours, weeknights are when I try to use my ‘set it and forget it’ recipes. I’m always searching for ways to incorporate great taste and nutritious ingredients into my family’s dinners, especially in my simple meal ideas. This recipe was suggested to me by a friend and I adapted it to my taste from Food.com‘s version. My boys aren’t picky eaters, but they still balk at the use of the word ‘spinach’ in combination with the dinner they’re anticipating. Something about those pretty, leafy greens makes kids nervous. I swear, it must be ingrained in their DNA. They just can’t ever seem to believe that it might taste good, delicious even. That being said, my kids have heartily approved of this meal and not one leaf was left. It was a struggle for them not to lick their plates clean. 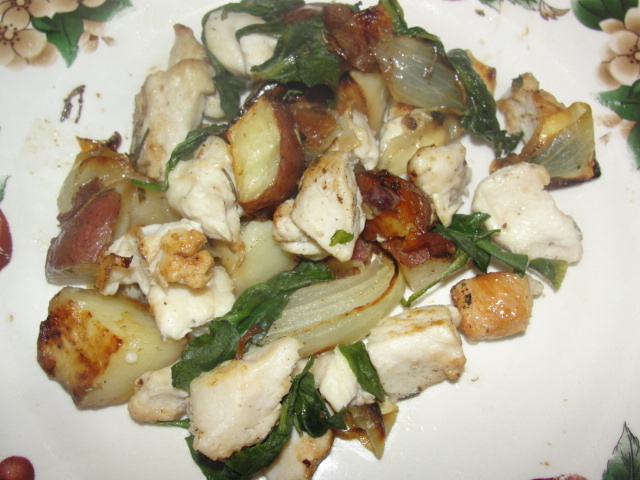 Even my husband was pleasantly surprised that just a few common ingredients could yield such a hearty, flavorful meal. Perfect for a chilly fall evening. 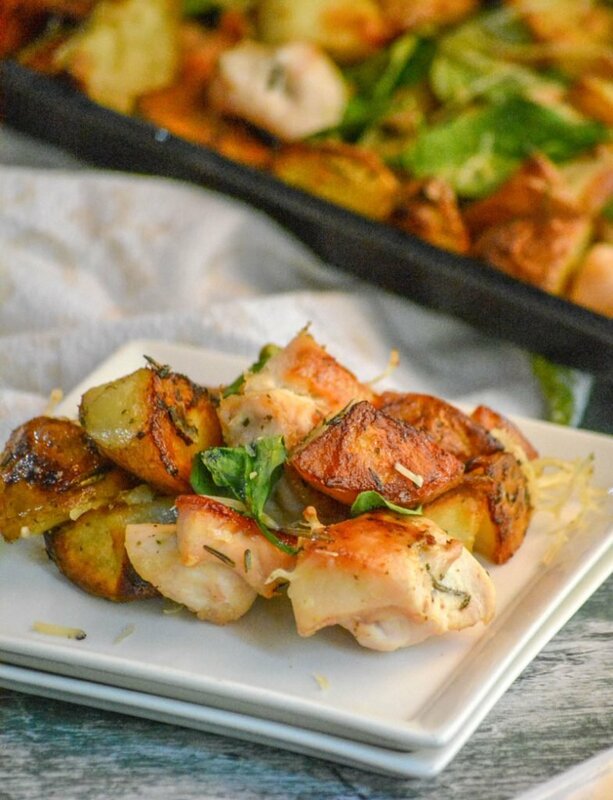 This Roasted Chicken and Vegetable Sheet Pan Supper is an easy dinner, that doesn’t disappoint on any level. I don’t know exactly who first dreamed up the sheet pan supper, but that person was a certified genius in the kitchen. A real miracle worker. They deserve a lifetime achievement award. All your protein and your veggies on a single tray, baked to roasted perfection that leaves you with only ONE pan to clean after dinner. You can even line that sucker with some aluminum foil and just throw it away when done, then you’ve got no clean up. Just wad it up, and toss it. 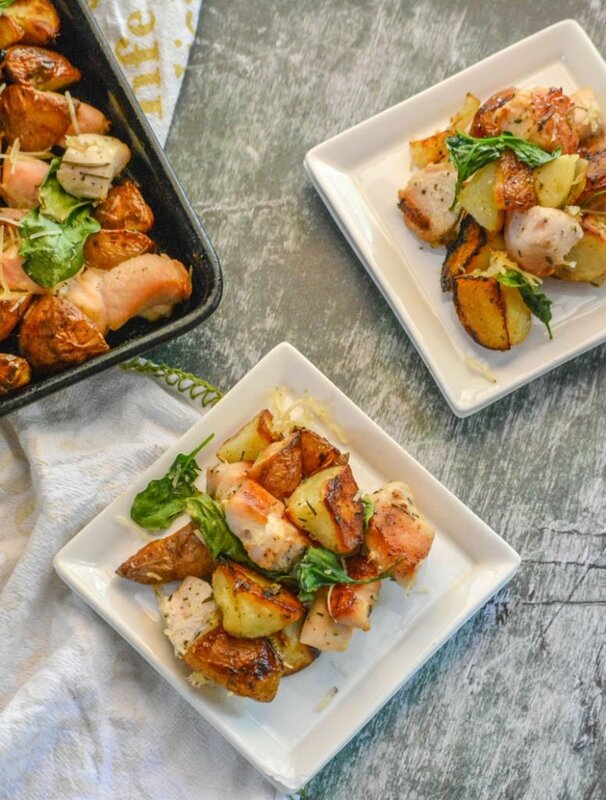 We’ve opted to chop our chicken in this dish for quicker cooking, and because bite sized pieces are easier to serve in our large family. Plus, my kids are a zillion times more likely to eat anything in miniature, and anything that doesn’t require the extra work of chopping (or using a knife) on their part. Kids can be weird. And mine can also be ridiculously lazy. We’ve been on a Little Potatoes kick recently. Again, the whole miniature thing- plus I find them equally adorable and delicious. You can also use russet, red, or Yukon gold. We’ve made this with all of them and they’ve all worked out yummily. You can also swap the chopped chicken breast out for chicken thighs. Either skin on or off, bone in or boneless all work. If using them, especially ones with the skin still on- in leu of tossing I’d suggest just brushing them with olive oil from the pan. Don’t make the mistake of adding the chicken in before the recipe calls for it. I’ve done it on a handful of occasions and each time it’s burnt to a crisp. Thankfully the meal was still salvageable, but sadly not as enjoyable. 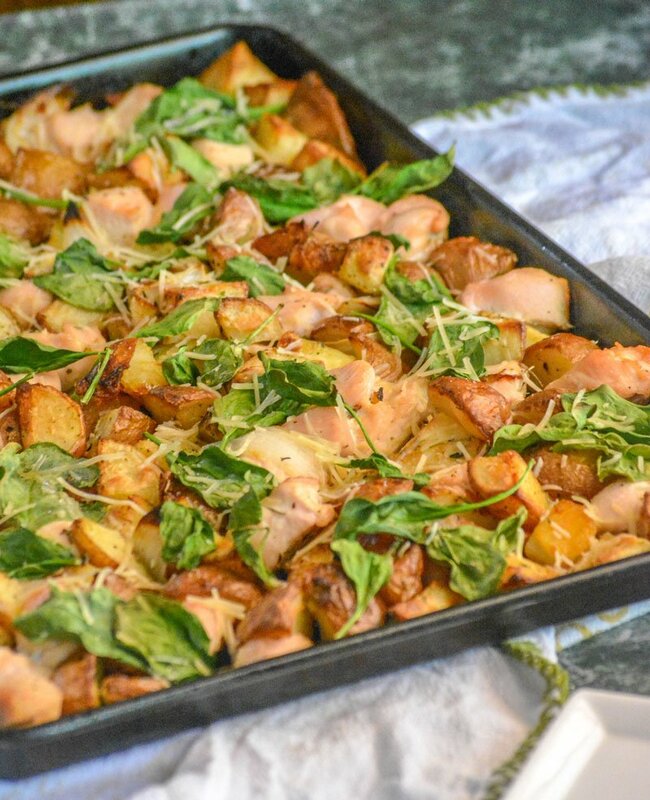 Our Roasted Chicken and Vegetable Sheet Pan Supper recipe features a couple main ingredients like chopped chicken breasts, diced potatoes, slivered white onion wedges, minced garlic, and fresh baby spinach. 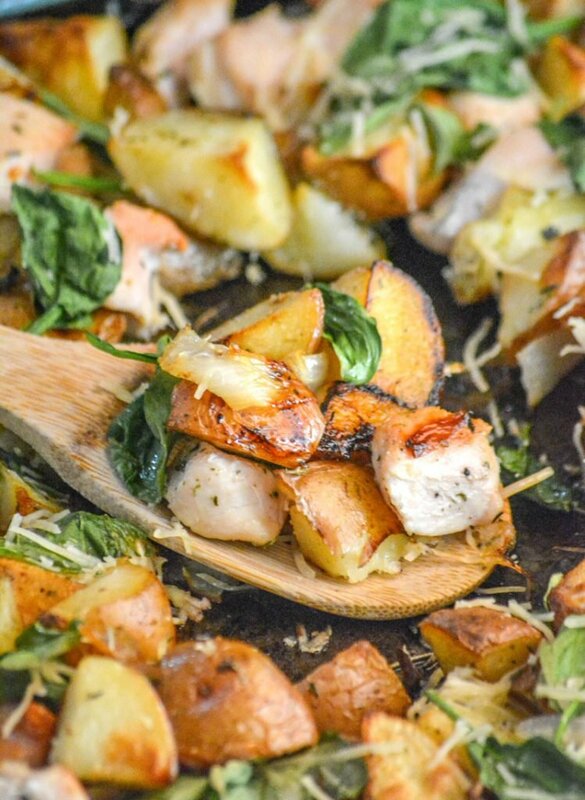 The chicken, potatoes, and garlic are tossed with extra virgin olive oil and simply seasoned with salt, pepper, and dried rosemary. As you’ll discover in this case, sometimes simple really is the best. 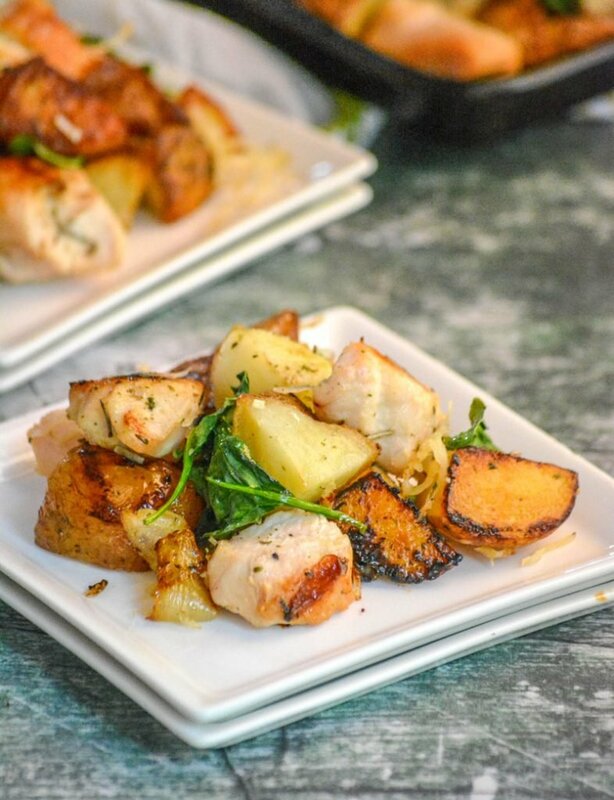 They’re roasted until the chicken is seared and savory and the potatoes are melt-in-your mouth tender. 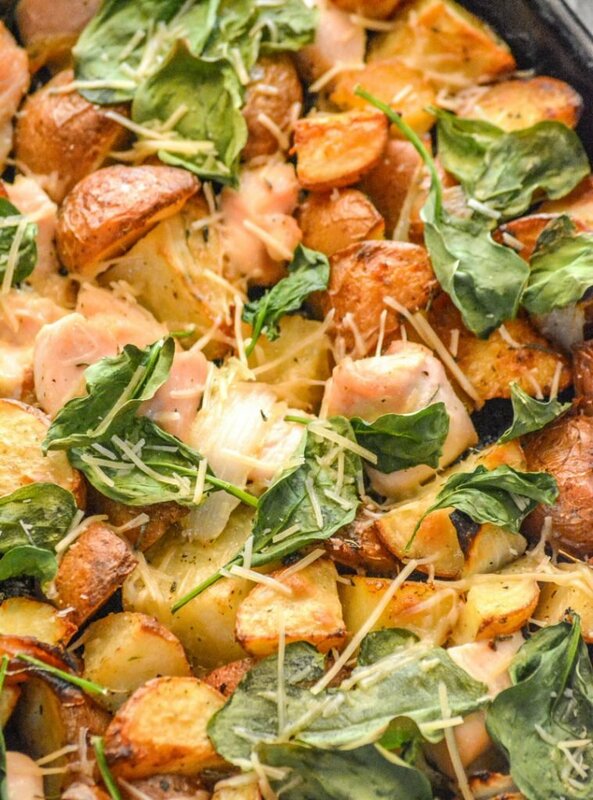 Topped with spinach and a sprinkle of shredded Parmesan, dinner is ready to be served. Everyone will be ready to kiss the cook, after seconds, of course! And that’s really something considering you’re serving spinach!! 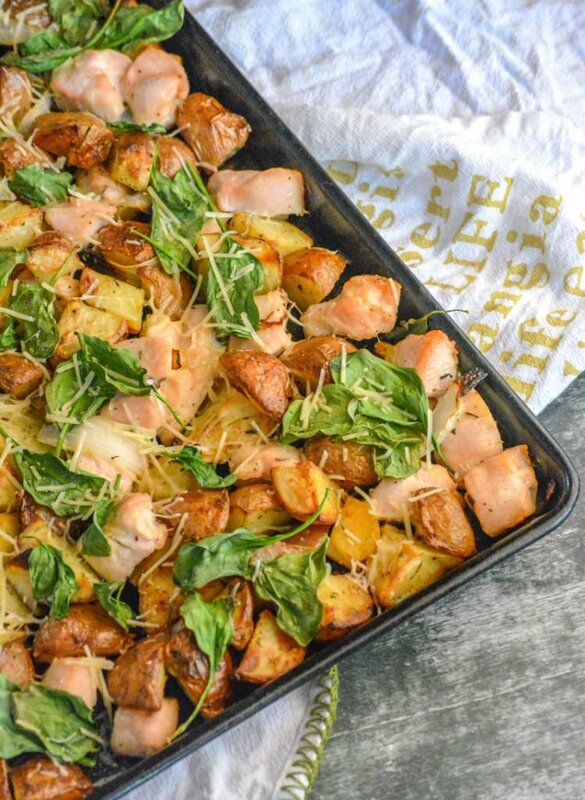 Other Sheet Pan Ideas You Might Also Enjoy: Ranch Pork Chop & Potato Sheet Pan Supper, Sausage Apple & Herb Sheet Pan Supper, Meatloaf Sheet Pan Supper, & Loaded Italian Style Nachos Sheet Pan Supper. 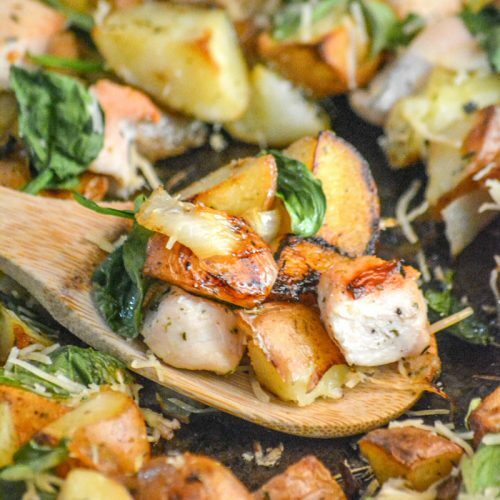 An easy family meal that cooks all on one pan, this one features roasted chicken with rosemary parmesan potatoes, caramelized onion wedges, and seasoned baby spinach leaves. In a large bowl combine potatoes, onion, garlic, olive oil, salt, pepper, and rosemary. Toss to coat. Pour the mixture into a large roasting pan. Roast vegetables at 475 degrees for 25 minutes, stirring once. Add chicken, tossing once more to coat. Roast 15 minutes longer, or until chicken is cooked through. Evenly distribute spinach over the chicken and vegetables. Roast 5 more minutes, or until spinach is wilted. Stir again. Sprinkle with the shredded Parmesan cheese, and serve. For some reason, I’ve never jumped on the one pan meal bandwagon, but this post is making me realize the error of my ways – this looks fantastic (and the new photos are beautiful!)! I’ll have to give this a try once the weather cools down. Thanks for bringing this to Fiesta Friday! You need to get on that train immediately! 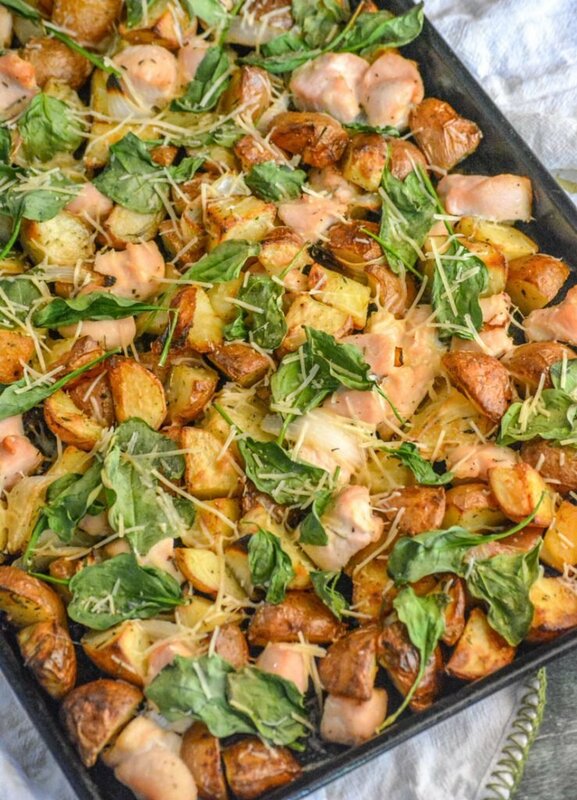 Thanks for the kind words, and you won’t regret giving the ‘one pan’ trend (or this recipe) a try.